Synology Inc. today announced the official release of Active Backup for G Suite/Office 365, on-premise cloud backup solutions for businesses to ensure the safety of data stored on G Suite/Office 365 drives cost-effectively. On-premise and cost-effective backup: With just a one-time investment, businesses can back up data stored on G Suite and Office 365 drives to local Synology NAS devices to effortlessly own and safeguard employee data. 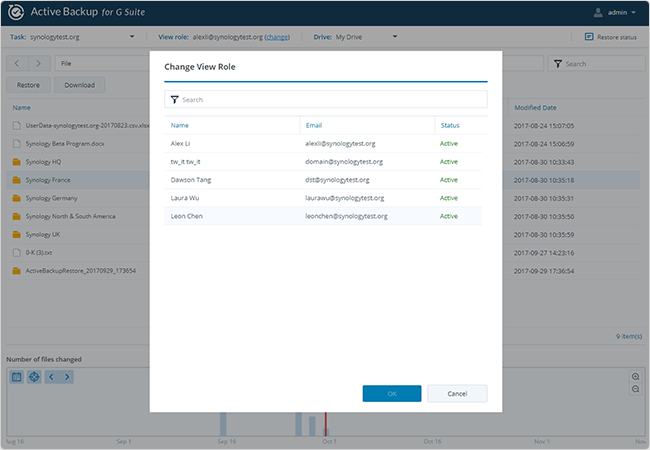 Automatic detection and backup of new accounts: Newly-created accounts will be automatically detected and added for backup, which minimizes management cost as well as the possibility of leaving any employee not backed up. Flexible RPOs with continuous and scheduled backup: Multiple backup policies offer the flexibility required to meet a wide range of RPOs. For example, continuous backup allows users to be backed up continuously to reduce the risk of data loss, while scheduled backup enables businesses to set up schedules based on their need. Self-service recovery portal: The convenient self-service recovery portal allows employees to restore files by themselves from an intuitive interface, which can reduce the workload of IT admins who are usually in charge of restoring employee data. Backup and storage efficiency: Single instancing ensures the efficiency of data transmission and storage by transferring and storing files with unique content only. Block-level deduplication helps businesses keep the most data while using the least storage space by merely saving a file’s blocks that are changed in comparison to its previous version. Complete file protection: In addition to user data, metadata and individual sharing permission settings can also be backed up and restored to G Suite and Office 365 accounts directly, providing comprehensive protection of business cloud collaboration environments. Team Drive Backup: Team Drives, which Google just released this year, is also supported for backup. What’s more, with the Team Drive discovery feature enabled, newly-created Team Drives will be automatically added for backup. Active Backup for G Suite/Office 365 are available on DiskStation, RackStation, and FlashStation.